The CAM5002 Drum Fan is a 24 inch floor mounted drum fan manufactured by Clarke one of the leaders in industrial cooling equipment. 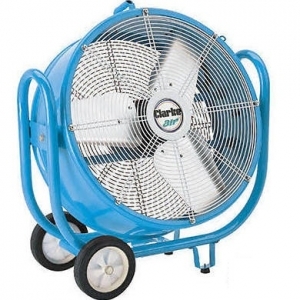 The fan is mounted on a wheeled chassis for easy movement. Three fan speeds are available with electrical protection provided via an automatic cut out. This model is suited for cooling industrial warehouses and workshop facilities. This model also comes with a bracket to mount the drum fan to the ceiling if required, making it ideal if having the drum fan on the floor in congested areas is a problem.